With 24 different floor plans to choose from, and high ceilings and huge windows in every apartment, we’ve got a layout that suits you. Have fun browsing our 3-D floor plans and find the perfect studio, 1BR, or 2BR. Arriving from out of town? No problem. Don't have time to shop for furniture? We've got it covered. We can have you move-in ready with available stylish, modern furnishings. Roll out of bed, hit the gym, and you're ready for the day. Our 24-hour access fully equipped fitness center will be ready and waiting. Check back soon for our equipment list, or let us know if there's a machine you can't live without. We know they're part of the family. Dogs, cats, birds…bring 'em all. See you across the street in Kendrick Park! 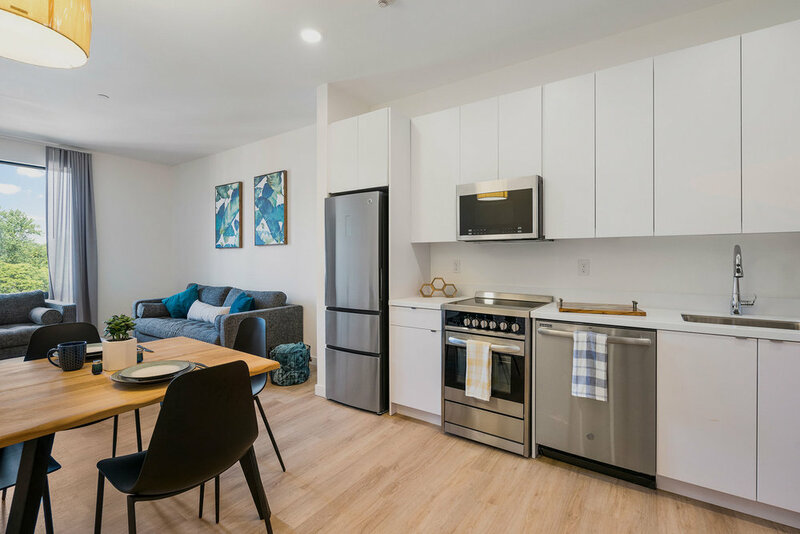 Located in the heart of downtown Amherst, you’ll be walking distance from great places to eat and drink, do your shopping, meet friends, and of course get to campus on time. Historic Kendrick Park across the street is full of gorgeous, mature trees, and a great place to walk, meet up, study, and relax.